Pre-arthritic hip pain is a common occurrence among athletes, especially those competing in ice hockey1 and field-based team sports (soccer, rugby, and football).2 While this area receives less attention than knee or shoulder injuries, current research is beginning to improve diagnosis and treatment of both intra-articular and extra-articular hip pathology. But, what about return to sport? How Do We Determine Return to Sport? 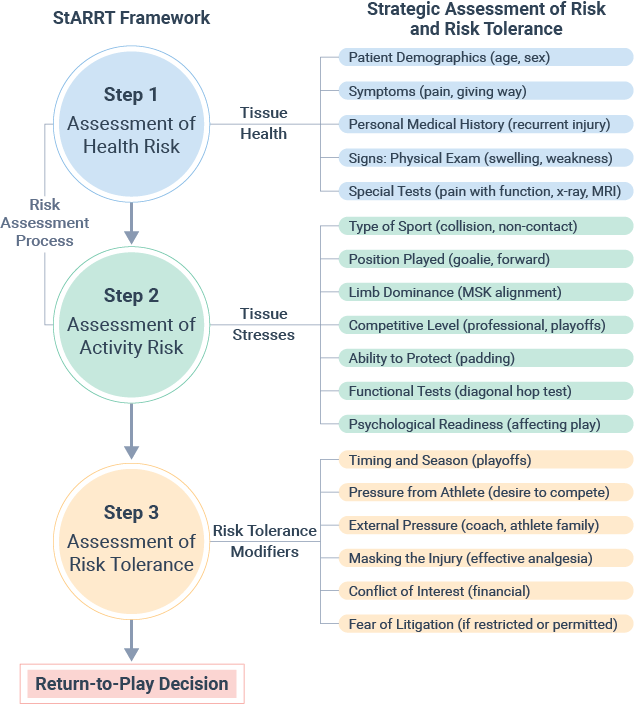 The StAART Framework (pictured below) proposed by Shrier and colleagues sums up this approach.8 It allows the clinician to comprehend and address all areas impacted by an individual’s readiness to return to sport. The modified star excursion balance test (also known as the Lower Quarter Y-Balance Test) has been successful in identifying asymmetry and impaired proximal stability in many conditions. Recently, Johansson and colleagues performed the first study to determine the criterion and divergent validity of the SEBT in individuals with femoroacetabular impingement11. They determined that SEBT performance in the posterolateral and posteromedial directions had high to moderate criterion validity in relation to the HAGOS subscales for pain intensity and symptoms. Additionally, the posterolateral direction and ADL function showed high to moderate criterion validity. Finally and most importantly, the SEBT showed adequate divergent validity and could successfully differentiate between healthy individuals and individuals diagnosed with FAI. Several recent studies have investigated if hop testing is appropriate in this population. 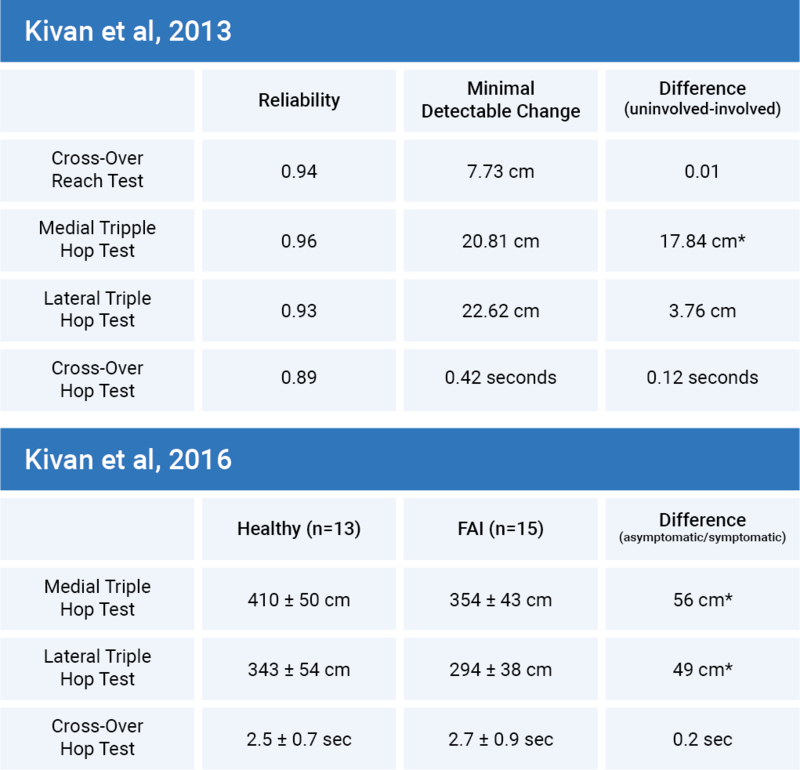 Kivlan and colleagues evaluated the difference in hop testing (cross-over reach test, medial triple hop test, lateral triple hop test, and cross-over hop test) between the involved and uninvolved hip in dancers with hip pathology.12 All tests demonstrated excellent reliability (0.89 – 0.96); however, only the medial triple hop test showed a significant difference between the two limbs with the non-involved limb achieving 17.8 cm more distance than the involved limb. Further supporting the use of hop and dynamic balance activities, findings from another recent study determined that following arthroscopic hip surgery and concomitant rehabilitation, patients demonstrated > 90% limb symmetry index in the performance of a single-leg squat test, single-leg vertical jump, single-leg hop for distance, and single-leg side hop.14 While this information shows that we can achieve an LSI that is often used in return to sport of athletes post-ACL reconstruction, functional testing should be used with caution when translating it to a population of athletes with hip pain. In the absence of definitive return to sport criteria, the clinician must focus on the tissue health (the load the tissue can absorb before injury), individual tissue stresses imposed by the athlete’s chosen sport and competition level, and any pertinent psychosocial factors (fear of re-injury). Return to sport testing should be considered with caution as little evidence is available for this patient population.